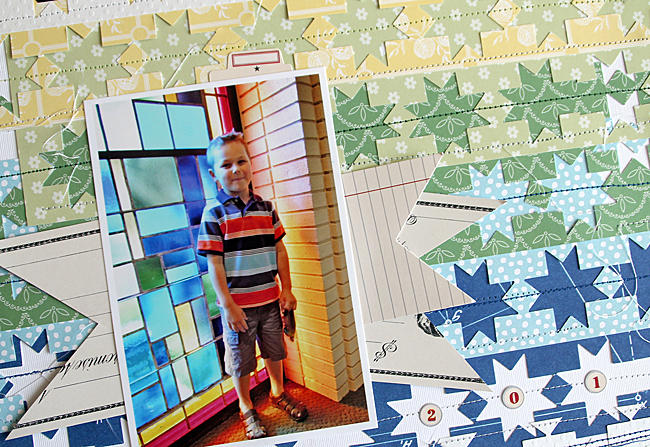 I made this page using Jenni's new Quilt Star Punch which I used like a border punch. The punch is 1.5" wide so it's a great size. 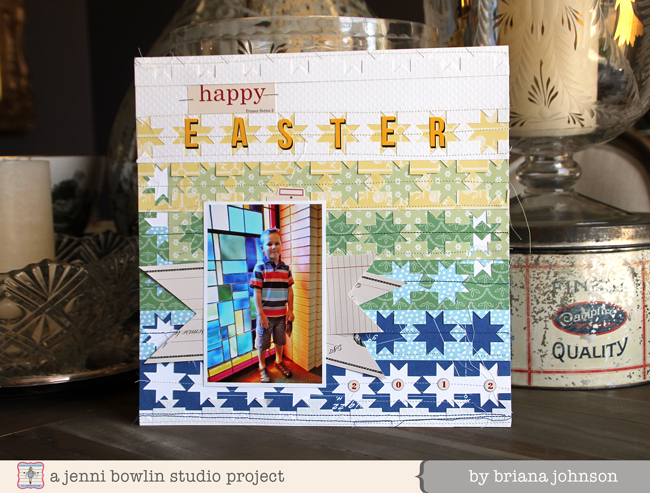 I used the new JBS Modern Mercantile line designed by Lisa Dickinson as well as a piece of blue paper from Wren. 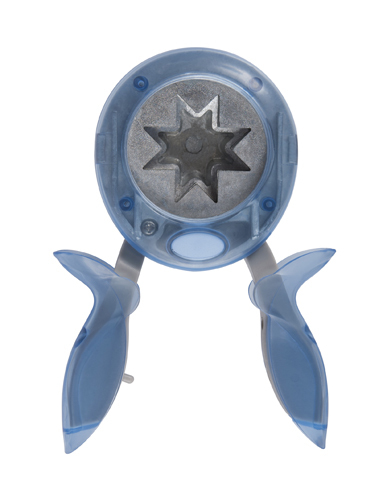 The light blue dot was an exclusive from the February Mercantile Main Kit. When I got these papers out, I knew I had the most perfect picture to use with them - a photo of my son standing in front of the stained glass window at church on Easter Sunday last year. Modern Mercantile is perfect for all kinds spring and summer stuff! It reminds me of green grass, sunshine, and blue skies. This page is going in my Project Life album as the intro to the Easter Project Life pages I made using the February Mercantile kit. Look how well these papers go together. From Wren I've used Blueprint. From Modern Mercantile I used: Hodge Podge, Patchwork, and Miscellany. After I had glued down the border strips I sewed over each of them with coordinating colored thread. I used white along the top of each row and then went back with the matching color down the center of the star row. When I used the white, I pulled extra thread out when I rotated the page without trimming it and beginning a new row so that when I went back with the colored thread it trapped strands of white thread. I love the way that ended up - kinda messy with a bit of added texture. To ground the picture I cut banner tails in a strip from Fancy Checks and layered a printed tag, Vintage Flag, behind the photo. 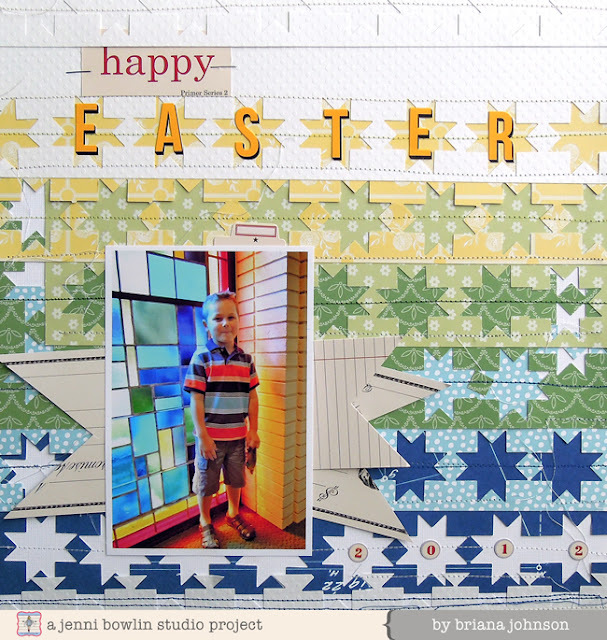 Here's an example of how I made the quilt star border using cardstock. I grabbed these sheets from my scrap pile and took the punch and punched right along the edge of the paper. Don't worry about getting the spacing just right - once you get all those layers going it doesn't look like they're supposed to be perfectly aligned, in this case anyway, and it ends up looking rather charming with the imperfections. Then you simply lay one sheet on top of the next and glue them down. To finish off the top of the page I punched the quilt star along an extra piece of the white dotted cardstock background to create a white on white border along the top. 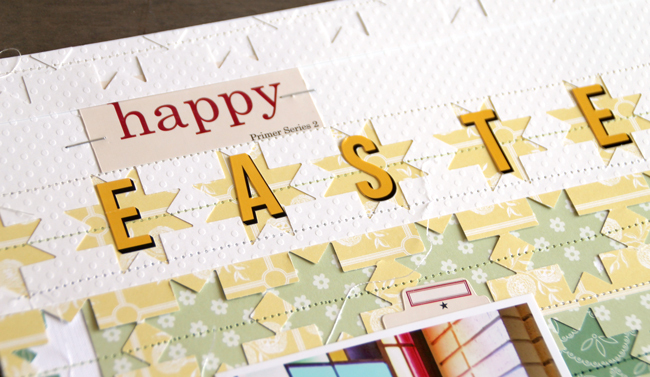 I trimmed and tucked the happy sticker under the white punched border. The dark yellow alpha stickers (Shadow Alpha Stickers) look so good with Modern Mercantile. Happy St. Patrick's Day and happy crafting! oh my yes - you totally rocked this punch Briana! this punch is one of my all-time faves! TOTALLY doing this! What an awesome way to use scraps!